When did you last have an affordable luxury afternoon tea in a church crypt? 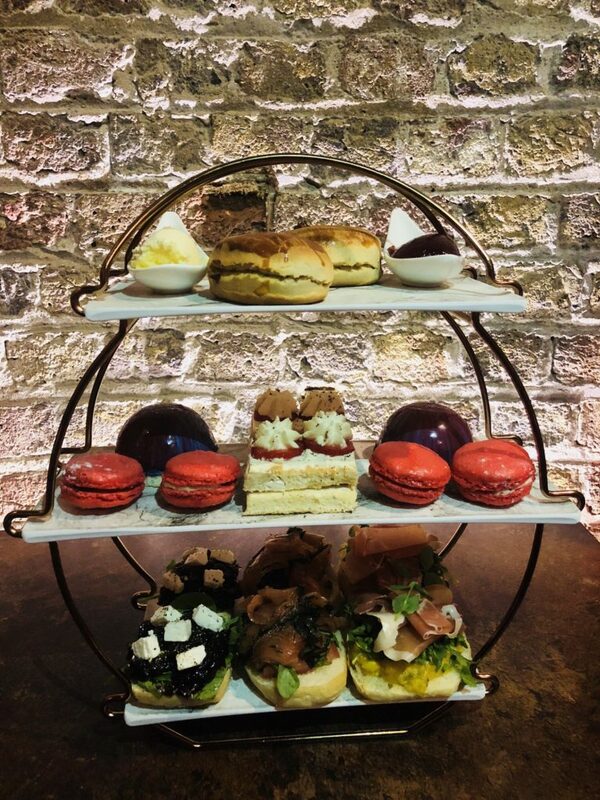 If you can’t say you ever have you really do need to book the Café in the Crypt Luxury Afternoon Tea soon. Especially as readers can enjoy an exclusive offer for a free glass of prosecco. 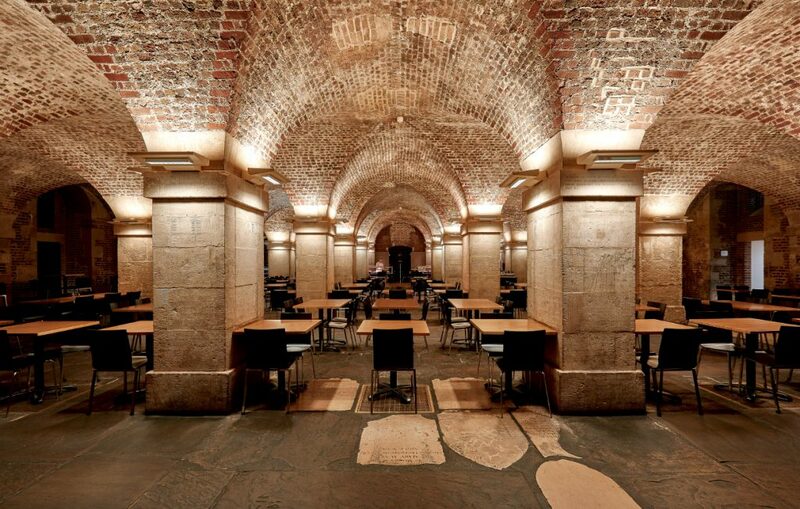 A wonderfully central location, Café in the Crypt is under St. Martin-in-the-Fields at Trafalgar Square. I like the cafe a lot and have been going there for years. 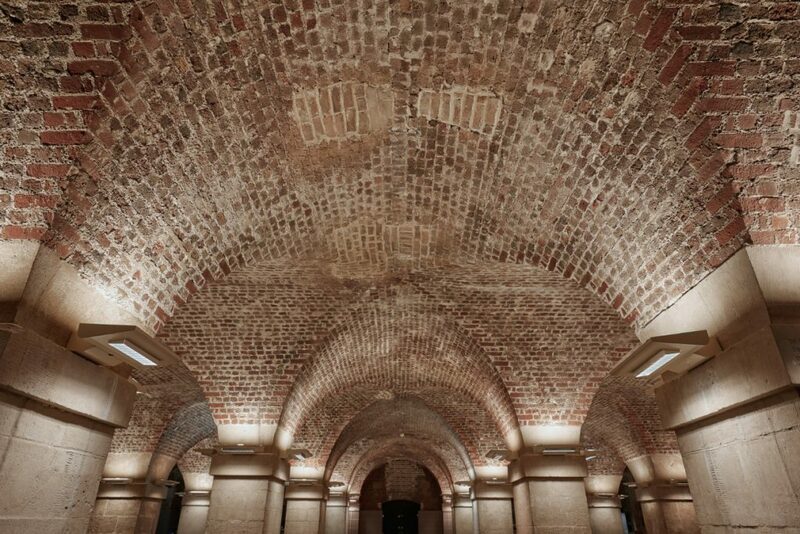 It’s in an underground, eighteenth-century brick-vaulted church crypt with gravestones used as flooring. It can get busy yet we all like to think of it as our secret place to meet with friends. 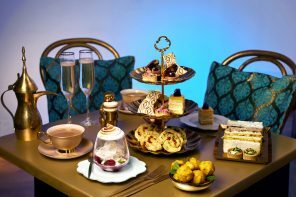 But book the luxury afternoon tea and you get a private room plus table service. This landmark Anglican church in the heart of London was built between 1722 and 1726 based on a neoclassical design by James Gibbs. 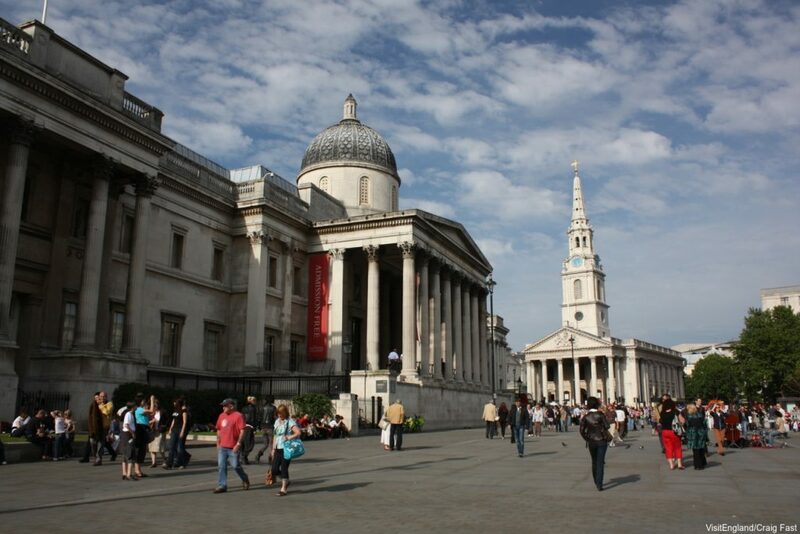 Located at the northeastern corner of Trafalgar Square, there has been a church on this site since the thirteenth century. Its magnificent imposing Corinthian portico has been much copied in the U.S. where it became a model for the colonial style of church building; the closest replica is St. Paul’s Chapel in downtown Manhattan. St. Martin-in-the-Fields was commissioned by George I who was appointed a churchwarden. It is still the official parish church for Buckingham Palace. 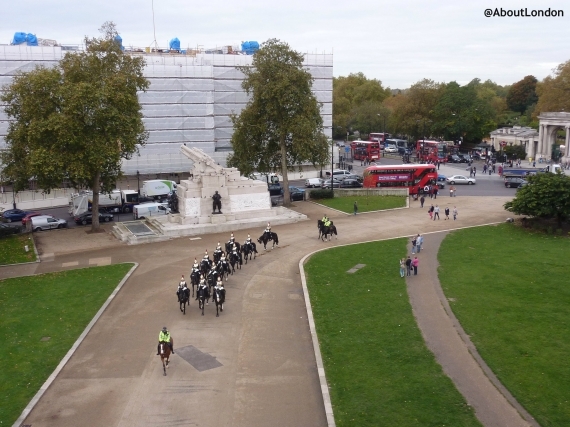 Inside, there is a royal box on the left of the altar and one for the Admiralty on the right. Since the First World War, St Martin-in-the-Fields has cared for the homeless every night too. To fund their good work the church was renovated with a larger cafe opening in 2008. The church hosts regular music performances and recitals and has been a concert venue for over 250 years. Handel and Mozart have both performed here. As well as the Café in the Crypt there’s also the London Brass Rubbing Centre plus a decent gift shop for interesting souvenirs. 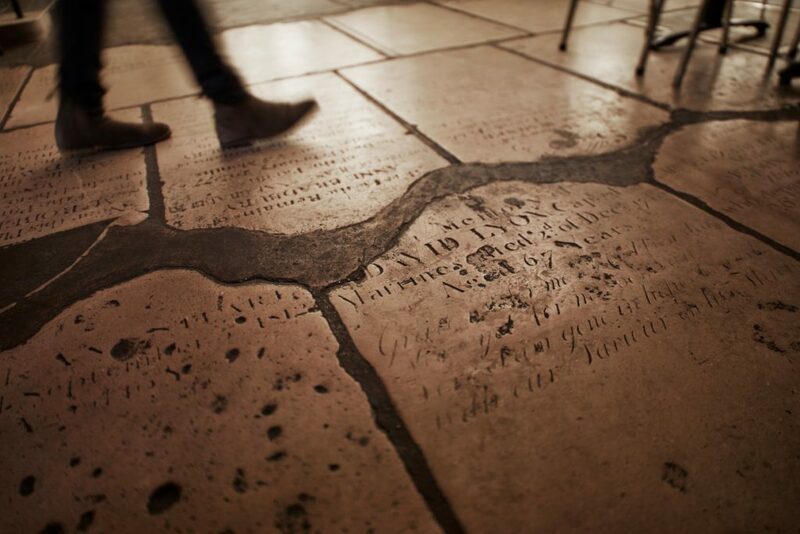 Do notice the gravestone flooring in the Café in the Crypt. The luxury afternoon tea is served in the apse. While the main cafe has a large seating area and is busy all day, the Apse is a quiet circular side room which feels much more intimate and private. The room is divided into four quarter-circle curved seating areas with space for a group of four to sit comfortably together (three on the curved seating against the wall, with cushions, and one on the seat on the other side of the table). The Apse does have a limit of a maximum of twelve diners so it will never be over-crowded. And numbers like that make it a really good choice for a group booking for a birthday or celebration. I visited with my twelve year old daughter. And when space for four is being used by just two it can feel even more luxurious. By the way, the Apse has excellent acoustics so don’t try to resist speaking from the middle of the room to hear your voice projected. Glasses and a jug of cold water, as well as teacups and plates, were in place when we were walked to our table. It was the little touches that make this afternoon tea stand out as there were extra plates ready for us so we could have a clean plate for our cakes and scones, after our sandwiches. As your seating is reserved and your options are pre-booked your only decision is which tea to enjoy. A jug of hot water was already in the Apse and we chose from a presentation box of Teapigs teas. This meant our tea was poured within minutes and our polite server could go and collect the cake stand. The teas are individually wrapped teabags. When we visited there were six options available: Everyday Brew, Darjeeling Earl Grey, Mao Feng Green Tea, Peppermint, Camomile and Superfruits. Coffee is available too. 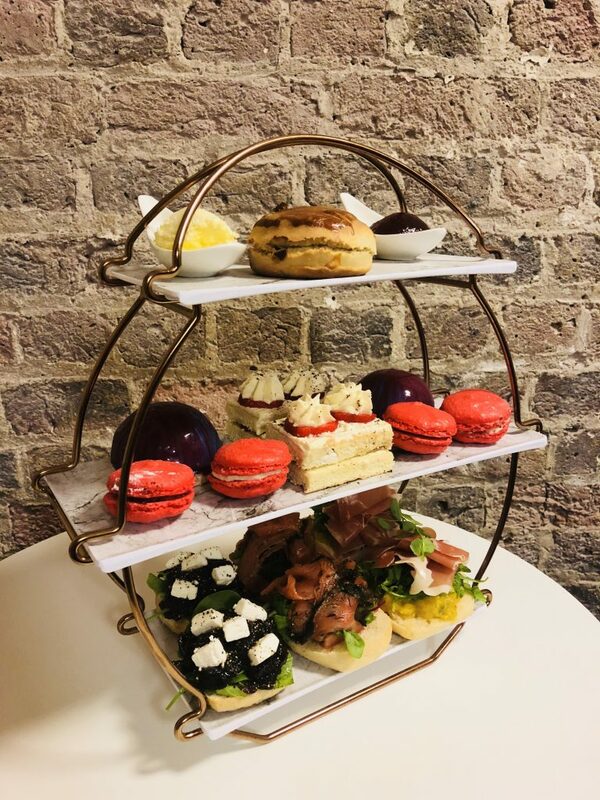 Café in the Crypt have used some different style cake stands but we got a three-tiered ‘circle’ with sandwiches on the bottom layer, scones on the top and the longest layer in the middle devoted to the cakes as the extra space was needed for six sweet treats. Staff who work in London hotels are trained to explain and describe a cake stand’s contents and it was good to see that tradition happened here too. Alice served us with confidence and was exactly the type of staff member who makes tea and cakes a special occasion. We had large open sandwiches served on English muffins. I was able to choose extra vegetarian options in advance. The positives of open sandwiches are that you get to see the contents and the chefs can better use their presentation skills. But its kryptonite (my daughter’s description for a downside) is that they are not as easy to hold and so dining can be more awkward. I really liked the feta, leaves and red onion chutney sandwich but my daughter wasn’t keen on the salmon as she found the fennel overpowering. I would actually say the sandwiches could be smaller as we were pretty full when we got on to the cakes. But don’t worry, we didn’t give up. 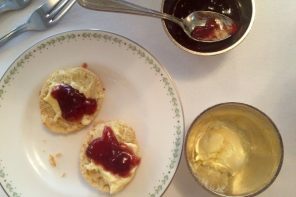 Each diner has a large fruit scone each with plenty of clotted cream and strawberry jam/preserve. I was impressed that the scones were still warm after we had finished our sandwiches. And they cut in half easily which is a sign of a quality scone. As London has been experiencing a heatwave for some time the frozen chocolate mousse was a wonderful inclusion. Visually stunning, this domed treat was topped with spun sugar. Once cut in half we found a delicious chocolate ice-cream flavour. My daughter tells me it’s just like Ben & Jerry’s ‘Wich except better. Our macaron was the right combination of crisp and soft, if you know what I mean. The blueberry filling was excellent too. But after we had already eaten so much the raspberry eclair defeated us. I think it was simply too big! This got us thinking about the cakes at an afternoon tea and how they have got to be easy to lift from the cake stand to your plate. For this reason, we both thought a mini cupcake would work well and maybe a fruitcake simply because the density makes it a firmer cake to move. 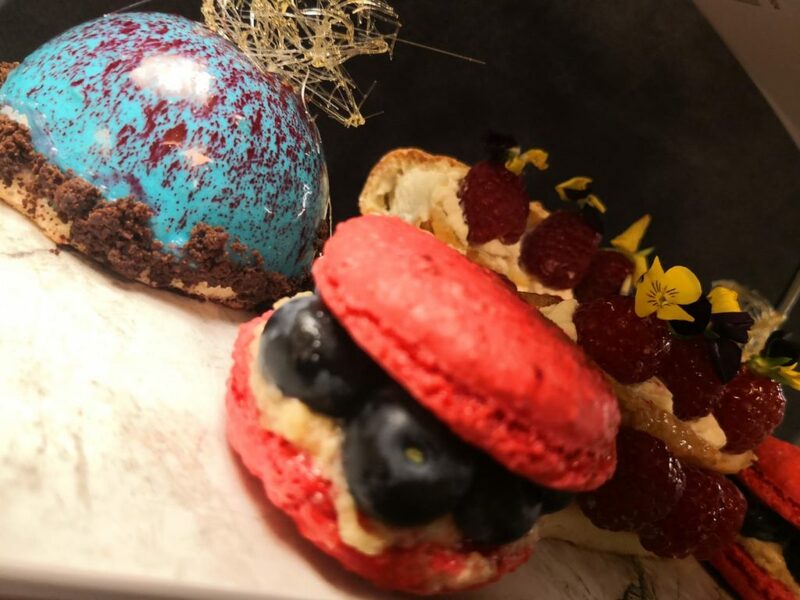 As the service and quality of the food were so good it took me a while to find the differences from the higher-priced afternoon teas in London hotels. Here, there is no crisp, white linen tablecloth or napkin. But the tables are clean and there are plenty of paper napkins available. 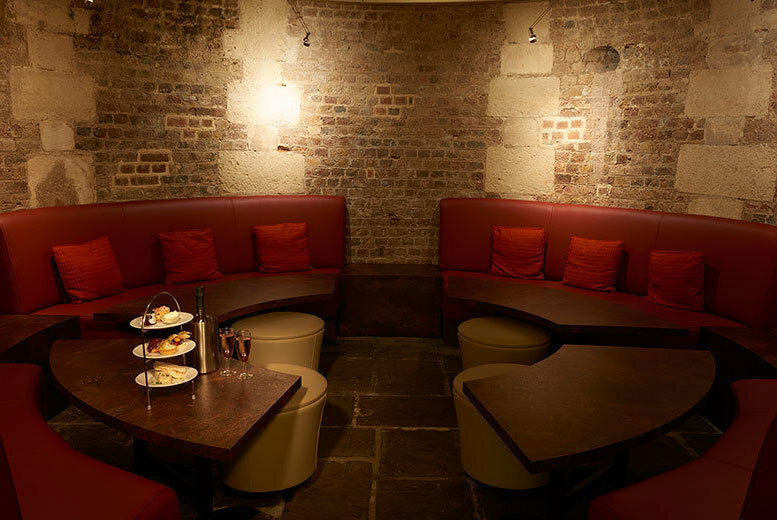 Café in the Crypt Luxury Afternoon Tea costs £18 per person. It is available between 12pm and 6pm (1.5 hour sessions). 48 hours notice is required and a deposit of £5 per diner applies. 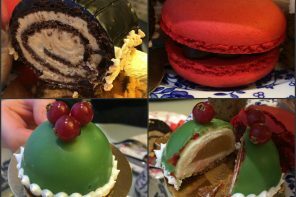 You select your sandwiches and cakes in advance from the online menu (see link below). Each diner may choose one sandwich with meat, one sandwich with fish, one vegetarian sandwich, three cakes and one scone. 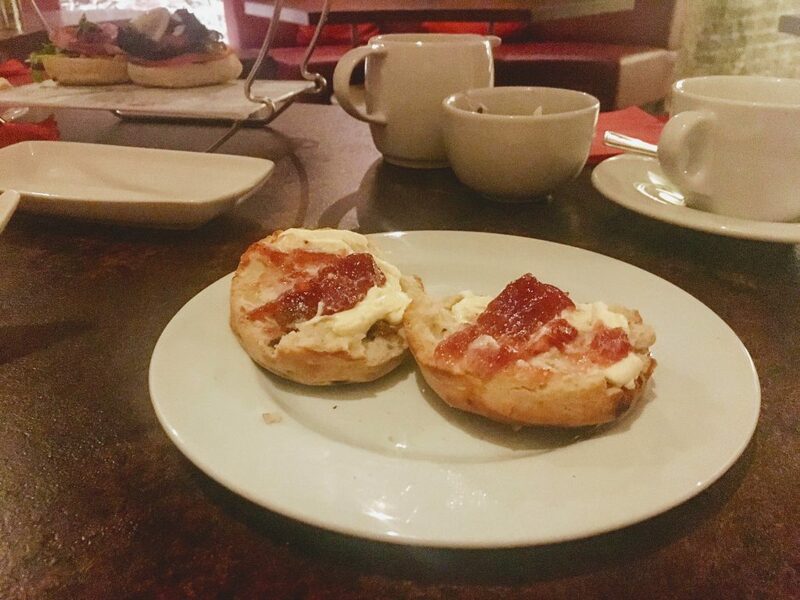 If money is really tight, Café in the Crypt still offers a basic afternoon tea in the self-service area which includes all the important elements (sandwiches, scone, cake, tea) but no reserved seating or table service. This doesn’t need to be booked in advance. Now, you may not be expecting this as a recommendation to enjoy on the same day as afternoon tea but that’s what makes London so wonderful. As you’ll be dining in a church crypt why not try some brass rubbing as this used to be a popular activity in churches? 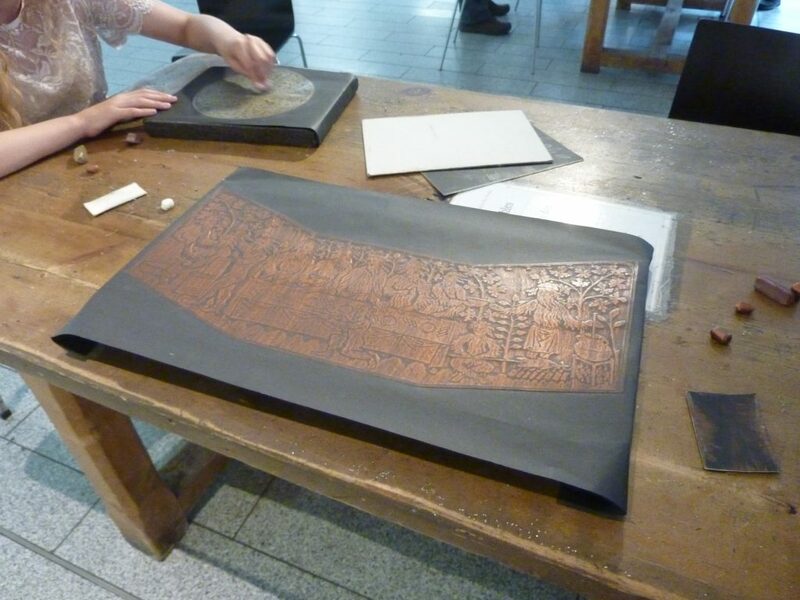 The London Brass Rubbing Centre is next to the cafe and has lots of sizes and designs to choose from.